The huge untapped mineral deposits in the Arctic have triggered heated debates among the circumpolar states on demarcating their respective economic zones. Several countries are laying claim to the Lomonosov Ridge, the main subject of the territorial disputes. Russia and Canada are the most active in claiming the right to expand their presence on the continental shelf in the central section of the Arctic Ocean. In 1948, the Soviet Union organized the North 2 expedition whose members obtained initial data indicating that the Lomonosov Ridge was likely to be discovered. While conducting hydrological measurements, scientists managed to discover some shallow areas north of the New Siberian Islands. This data didn't reach any hard conclusions, but a theory implying the existence of a ridge that divides the Arctic basin was advanced. In the spring of 1949, the Soviet Union sent a new airborne expedition, called North 4, to this area of the Arctic. 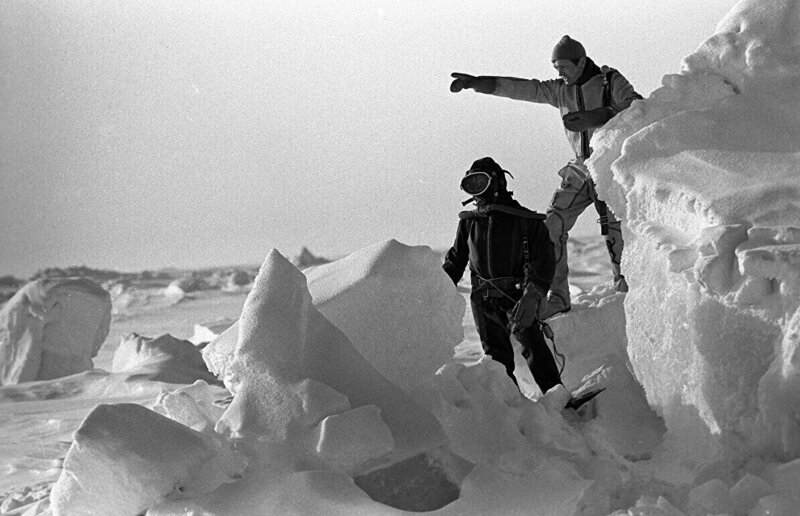 The expedition participants — hydrologists Alexei Tryoshnikov and Leonid Balakshin — discovered one of the underwater ridge's peaks 280 kilometers south of the North Pole on April 30, 1949. The pilots risked their lives while landing on and taking off from various sea-ice formations. In turn, the scientists collected evidence confirming their conjectures. Their measurements made it possible to prove the existence of an underwater ridge rising 2,500-3,000 meters above the seabed and stretching from the New Siberian Islands to the North Pole and then on to the Ellesmere Island. These Soviet trailblazers aptly named the important ridge in honor of Mikhail Lomonosov, a worthy representative of the Russian Arctic's Pomor community and the country's first world-class naturalist. Lomonosov considered it important to develop the Arctic, which conceals huge untapped mineral resources. Since its discovery, the ridge's legal status has been determined by a number of international conventions, including the UN Convention on the High Seas, the Convention on the Continental Shelf and the Convention on the Territorial Sea and the Contiguous Zone. However, these legal documents were unable to completely resolve all the issues of these disputed territories. In this connection, the UN Convention on the Law of the Sea was signed in 1982, stating expressly that the continental shelf of any coastal state would include the seabed and mineral deposits beyond territorial waters and is defined as the natural extension of the land territory to the underwater continental margin's outer edge. Thus, if any state proves that the shelf is part of its respective continental plate, then, according to clauses 4-7 of the convention, it can expand the boundaries of its maritime territories. Of course, this has inevitably provoked a struggle between the polar states for such a desirable slice of the Arctic. However, the situation was complicated by the absence of generally recognized research data on the origin and essence of underwater ridges and elevated areas. The Russian Federation, one of the main competitors in this race, has used substantial material and human resources to study the Arctic down to the smallest detail. It took members of at least seven polar expeditions a lot of time to collect essential data about the geological makeup of the Artic Ocean's seabed. Their main goal was to prove that the underwater Lomonosov Ridge is part of the Siberian continental plate. From the legal standpoint, this would mean that the concerned territories are related to the Russian continental shelf. In December 2001, Russia submitted its first bid to expand its external borders. A year later, members of the UN Commission on the Limits of the Continental Shelf said the evidence was not enough to legalize Russia's rights for these territories. In 2007, Russia resumed studying the seabed and the boundaries of the Siberian continental plate, doing its best to find additional substantiation. The Arctic 2007 expedition caused an unprecedented international response because, on August 2, 2007, the Mir-1 and Mir-2 deep-sea submersibles descended to the seabed of the Arctic Ocean under the supervision of noted Russian polar explorer Arthur Chilingarov for the first time in the history of polar exploration, and members of that expedition planted the Russian flag on the Arctic Ocean's seabed, triggering an international outcry and indignation. In 2015, Russia submitted another bid to the UN. Obviously, other countries are also interested in this region that abounds in energy resources. Along with Russia, Canada is attempting to defend its rights to the disputed territories. In 2008-2009, the United States and Canada conducted joint shelf research in the region, doing their best to prove that the ridge is part of the North American continental plate. Expedition members worked in areas north of Alaska and stretching toward the Mendeleyev Ridge, as well as east of the Canadian Arctic Archipelago. American and Canadian scientists were able to collect data showing the state of the seabed and the continental shelf, also taking photos and shooting videos. Canada used this data to submit a bid to expand its borders to the UN for consideration. According to the Canadian government, the observations of the country's researchers have proved that the Lomonosov Ridge is a natural continuation of the American continent. Canada plays a major role in Arctic development issues because it is one of the largest polar states in terms of area and it has shown strong interest in the Arctic region. Canada's location and its cutting-edge technology for developing these territories are an obvious advantage. Denmark also laid similar claims to the continental shelf, with its government stating that, according to scientific data, Greenland's continental shelf is directly linked with seabed geology. This allows the Danish to claim the right to own a 900,000 square kilometer area north of Greenland, an autonomous constituent country of the Kingdom of Denmark. The United States, which is drafting a similar bid, so far lacks a weighty argument for legalizing the disputed territories and for submitting the relevant documents to the UN for examination. Surprisingly, the Lomonosov Ridge, a subject of debate and disagreement, can also be seen as a diplomatic bridge between rival countries as they work to acquire this desirable part of the Arctic, because they must also work together to resolve this issue through political methods. Otherwise the UN has the right to grant international status to these promising territories, allowing various countries, including non-polar states, to develop it. Therefore efforts to hammer out a treaty on the Lomonosov Ridge are a high-priority for the Arctic states.